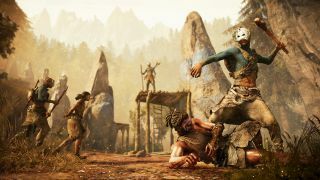 Phil recently had an extended hands-on session with Far Cry Primal, Ubisoft Montreal's prehistoric riff on the open world shooter format. As the video above demonstrates it's definitely a Far Cry game, only there are no guns in the Mesolithic age, nor are there vehicles or wingsuits. Instead you have makeshift melee weapons, bow and arrows and, weirdly enough, an owl. Oh, and a pet wolf. Above is ten minutes of footage from the PS4 build (PC wasn't available at the preview session, unfortunately). As Phil and Sam explain, movement is very much in keeping with the last two instalments, only this time you'll use a rope instead of a grappling hook, and the wingsuit is out of the question. This isn't just a Blood Dragon-esque offshoot either: it's a fully-fleshed out Far Cry game. Far Cry Primal is expected to release in March.